Since Richard is a corporate schmuck now, I see the only training he is offering for the year is at Black Hat DC in February. I have heard him as a speaker at Shmoocon and in some smaller groups. I seem to recall that he presented a snippet of TCP/IP Weapons School at one local meet and would definitely recommend it. I think he will be ready to tweak the class to the appropriate skill level of his audience. The Black Hat training classes seem decent if unsurprising. Metasploit 3.0, Reverse Engineering with IDA Pro, ROOTKIT, TCP/IP Weapons School, and Web Application (In)Security probably would interest me the most. Instructor-led training is expensive! Speaking of Shmoocon, I plan to be there for all three days. It's an enjoyable event. A coworker was asking me about setting up Snort at home so he could get some experience breaking things. I put together some very rough diagrams with Dia. These are just common and inexpensive solutions for running Snort at home, either in passive (IDS) or active (Inline) modes. These configurations are all inexpensive. At most, you require an extra hub or switch. The only one that doesn't require anything other than the network cards on the sensor is an external inline sensor. 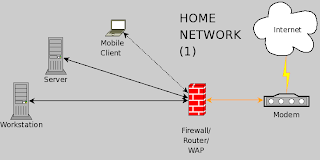 The first is a common home network configuration. This is basically how mine was before I installed Snort. You can't see internal addresses to identify individual systems. You need a higher performance system. This is not usually a problem on a residential service, but it should be noted that a lot more traffic will pass through system since it's not behind the firewall. You will see a ton of automated scanning and exploit attempts even if the traffic won't make it past the firewall. Placing the sensor outside the firewall is reasonable if you want to find out just how much activity is happening on the external segment, but it can be really noisy and you lose inside visibility. The third image is using an extra switch. In this example, you will see all traffic going through the firewall, as well as all broadcast traffic on the private network. You won't see unicast traffic between internal hosts, but you will be able to identify which host is associated with any given traffic that is seen. Bridging is enabled on the sensor and you can run Snort inline. This is my preferred configuration unless you have a lot of wireless traffic. The fourth diagram shows how to run Snort passively. There are two basic options. The first is a hub that will broadcast all traffic to all ports. This can hurt performance depending on how busy the internal network is. The second is with an inexpensive switch that supports port mirroring. I haven't used it, but I've seen an inexpensive Dell switch referenced that supports port mirroring. Note that it only supports monitoring four ports (PDF) at a time. In this configuration, you can see all traffic on the local segment in addition to Internet traffic. If using a switch with a mirror, you will probably need a separate management interface. If using a hub, the management interface can also do the sniffing. You could also use a hub between the modem and the firewall if you wanted to run an external passive sensor. EDIT: Based on Victor's comment, I added one other diagram. 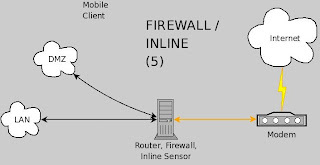 Diagram five shows the firewall and Snort inline on the same system. Victor uses iptables to filter the traffic first, then traffic that passes through the firewall goes to Snort running inline. He has separate Snort processes for the DMZ and the LAN. This configuration is slightly more complicated. There are exceptions, but the places I've worked in the past would not have considered using this type of configuration mainly because they were quite large and wanted off-the-shelf networking products rather than rolling their own firewalls or routers. It is still a useful and usable configuration to learn, and setting it up would provide a lot of valuable experience. Recently I have been reading more about managing multiple systems. One project I've heard good things about is Puppet. I also know another common choice is Cfengine. Cfengine is an automated suite of programs for configuring and maintaining Unix-like computers. After reading about each project, I am leaning towards trying Puppet. One thing that needs attention when keeping Snort tuned is updating the configuration variables in snort.conf when changes are made to the network. 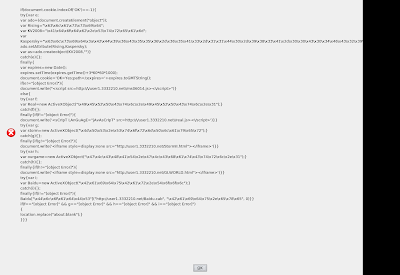 I recently noticed an alert was firing on legitimate DNS traffic because a new mail server was not in $SMTP_SERVERS. It's easy enough to add the IP to the SMTP_SERVERS variable. Note that you need the EAST_COAST_TV_SMTP and MICROWAVE_PROGRAMMING_SMTP variables set before they are used in the SMTP_SERVERS variable.